PNG is the most popular file format for storing graphics because of its lossless compression. Professional web developers use the PNG file format to store graphics for their projects. Also, there are situations when professional developers need a fast, easy-to-use tool to convert PDF to PNG on Windows. There are plenty of free tools for users, but how do you know which is the best one to choose? As a professional, you don't have the time to experiment with all of them. Therefore, in this article, we will provide a comprehensive guide on which is the best one and how to convert PDF to PNG on Windows and Linux systems. The best tool to use is iSkysoft PDF Editor 6 Professional for Windows (or iSkysoft PDF Editor 6 Professional for Mac ). 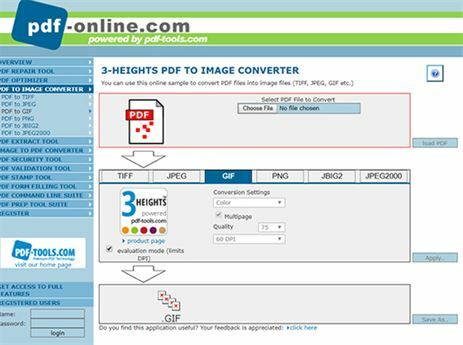 If you are a professional with graphics stored in PDF format, use iSkysoft PDF Editor tool to convert Windows PDF to PNG. iSkysoft is an excellent choice because it is a fast and an efficient tool with a lot of features to edit, convert and secure PDF documents. If you ever need a tool that gives you the freedom to edit PDF documents like Microsoft Office documents, then iSkysoft is the tool for you. iSkysoft is accessible on both Mac and Windows. So, let us move ahead to learn two ways of using iSkysoft tool to convert PDF to PNG on Windows. 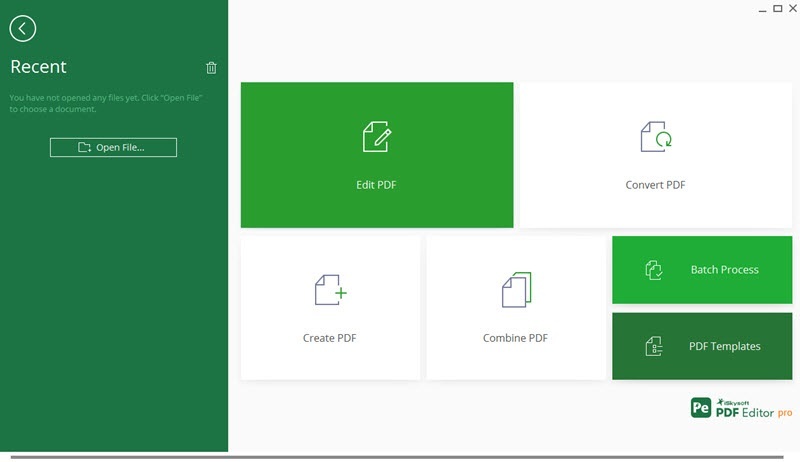 To start converting PDF to PNG Windows 10, download iSkysoft for Windows from the official website. Install the program. Restart the computer once installation is complete. 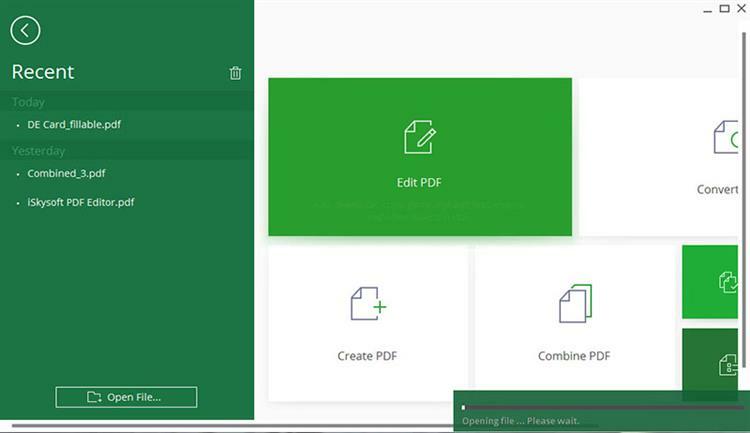 When you open the PDF tool, a home screen will load. Then, you can drag and drop the PDF file to the "Convert PDF" tab to import the selected PDF file to the professional PDF editor with ease. Once you load the PDF document, click on the 'Home' tab. Go to 'To Others' and select the 'Convert to Image'. Under the dialog box, choose PNG as the format and press the “Save” option. 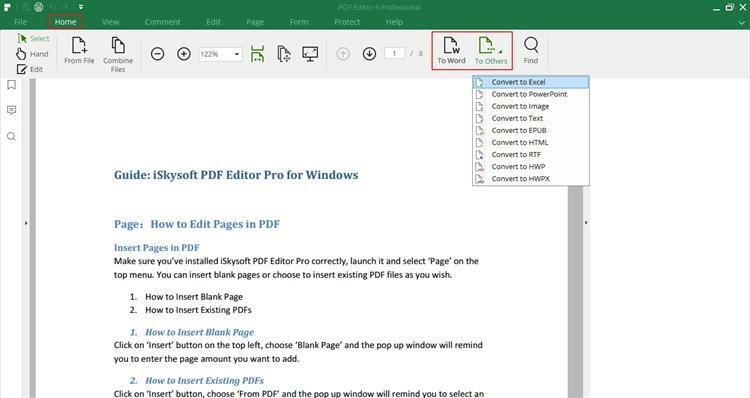 The second option on a Windows to convert PDF to PNG list of choices is to capture the PDF document and save in PNG format. On the welcome page of the program, you can click on the "Open File" button and select the PDF file from local file folder to open the PDF with ease. Once the PDF document is loaded, visit the “View” tab> capture the PDF using “Snapshot”> then save the image as PNG format. iSkysoft PDF Editor 6 Professional for Windows (or iSkysoft PDF Editor 6 Professional for Mac) is a software suite from Wondershare, the developers who are known for creating several software suites to optimize productivity for professionals. iSkysoft PDF Editor 6 Pro is suited well for professionals who work with PDF documents frequently and need a shortcut to make editing easier. If you a professional and you need to make changes to the text, images or other forms of PDF content, iSkysoft is perfect for you. If you need to convert PDF documents like PDF to PNG in Windows, even then iSkysoft is for you. Well, not only professionals or tech-savvy persons but everyone can use this toolkit due to its simple and easy to use interface. Edit text, images, and pages. OCR scanned PDF pages to extract data from the page. Markup and draw freehand on the PDF pages. 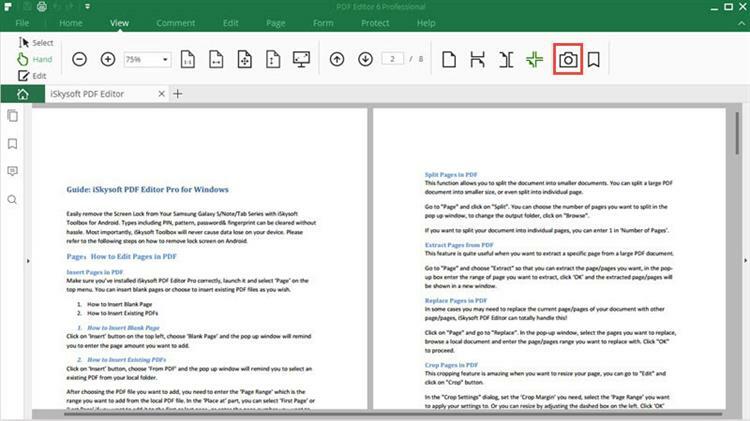 Combine and split several PDF pages. Create and fill out PDF forms. Add bates number to PDF pages. Linux is another kind of operating system just like Windows and iOS. There are several tools available to convert PDF to PNG in Linux. Here are the 3 best tools on the internet that we gathered and mentioned below to get more idea about PDF to PNG conversion. 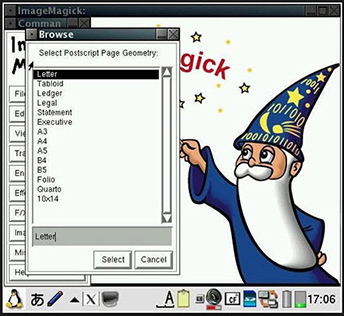 ImageMagick is a website that lets you create, edit and convert bitmap (and other formats) images. There are several things you can do with an image like you can flip, edit, rotate, distort and transform images. The image conversion software uses several computational threads to improve performance and can read, write or process pixel images. The best part of ImageMagick lets you modify and distribute the code, so you can customize the program as you see fit. Combine sequences images to create animations. 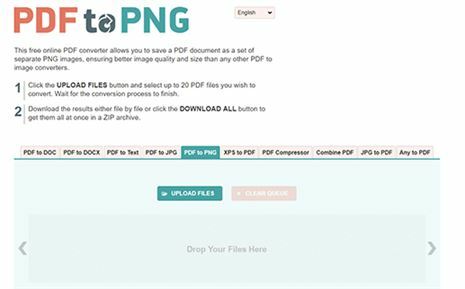 Convert image into different formats, including PDF to PNG. Comprehensive security measurements that include memory error and thread data race detection. Edit image as you see fit. 100% free – Don't pay a cent. Not as sophisticated as other desktop image editing programs. Some programming knowledge needed to understand the codes. PDF2PNG is the free online converter you need to convert PDF to PNG in Linux. It is a completely free tool that is perfect for converting PDF documents into any different format. Besides PNG, you can convert to Word DOC, JPG, and Text. You can do so much more with PDF files like combining and splitting PDF documents, and even the option to compress PDF files to more space. Free – No need to pay extra money. Browser-based no need to download software. Can convert PDF to other formats besides PNG. Can keep data on the site for 1 hour. Limited features compared to other options. Does not support all files types. PDF Online is also an excellent free tool that allows users to edit and secure PDF documents including converting PDF to PNG under Linux. PDF Online is a comprehensive website that gives you the freedom to make changes to a PDF document. Users can even change the document to a PNG file. It is a versatile, free tool that gives you lots of options. Convert PDF to GIF, PNG, TIFF, and JBIG2. Secure and validate PDF documents. Conversion takes time depending upon the data speed. The interface is not interactive.